Mooi expressief glas wijn! De fruitsmaken, de florale tonen en het houtgebruik komen allen op verschillende momenten langs. Mooi in balans! Extra: Drie maanden op 2de jaars barrique gerijpt. Expressieve, complexe en rijpe aroma’s van snoepige banaan, passievrucht, ananas. Subtiele tonen van boterbloemen en vanille door het houtgebruik. Erg interessant in de neus door het complexe scala aan aroma’s! Complexe, rijpe fruitsmaken zoals beschreven bij de aroma’s, maar door de verkwikkende zuren komt ook citroen sterker naar voren. Verder weer het tropische fruit, met zelfs honingtonen en weer de vanille en bloemigheid. Lekker lange en complexe afdronk. Wat een mooi expressief glas wijn! De fruitsmaken, de florale tonen en het hout gebruik komen allen op verschillende momenten langs, erg mooi in balans! Erg goed in combinatie met visgerechten met een beurre blanc of goed gekruid gevogelte. The Pago de Tharsys winery has a 12 hectare vineyard, which has extraordinary conditions that are necessary for cultivating their wines. The vineyards are located on a high plateau of approximately 650 meters with a slight slope in the Requena region, and experiences a climate of both continental and mediterranean influences. Yearly, the average temperature is 13 degrees Celsius. The summers are hot and dry, with extreme fluctuations in temperature from day to night. The winters are cold and can sometimes be rainy. The soil has a sandy structure with limestone. Pago the Tharsys cultivates Merlot, Cabernet Franc, Bobal, Albarino and Tempranillo. 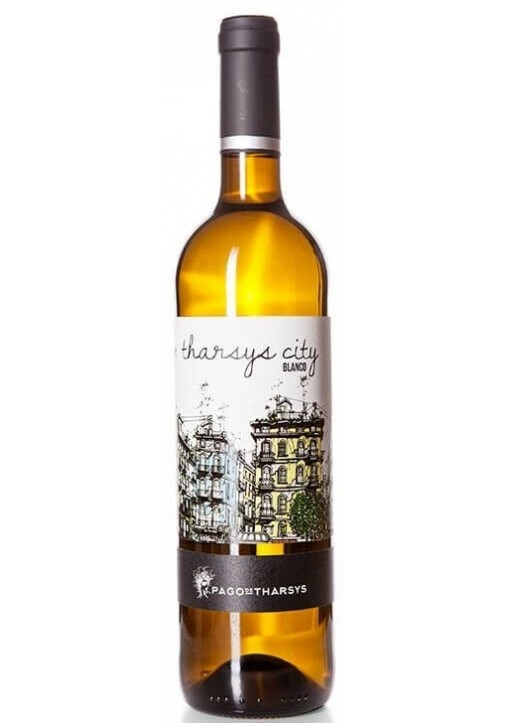 Experience and knowledge about Pago de Tharsys and their wines is the key to the high quality of the wines, and the characteristics of the soil that are present in their products. The special location of the cellar in the center of the vineyards enables the quick processing (within a few minutes) of the harvest, which prevents preliminary fermentation. Moreover, the wines are not treated further, which is why the natural qualities of the grape do no change. The winery uses specially selected French and American oak barrels to mature the wines, in order to give the wines the best wooden aromas.